Note:Recording is only supported on Seeeduino Mega and Arduino Mega for now. Multifunction button: Turn left to play previous song, and right to next song, while pressing it down to pause and resume. Volume indicator LED (RED): If volume+, the red LED will be brighter. Play/Pause indicator LED (GREEN): If playing, the green LED blinks. Line out can drive 16 ohm or 32 ohm earphone. Line in is used to record audio from other resources. I2S and GPIO are for digital audio output. ISP interface is kept for bringing SPI port when using with Mega. D2 - Used for receiving signal from iPod dock(could be used for your own application if iPod dock is not used). D3 - Used for receiving signal from button for Volume Up(could be used for your own application if the switch is not used). D4 - Used for receiving signal from switch for Next Song function(could be used for your own application if the switch is not used). D5 - Used for receive signal from switch for Play&Stop and Record function(could be used for your own application if the switch is not used). D6 - Used for receive signal from switch for Previous Song function(could be used for your own application if the switch is not used). D7 - Used for receiving signal from button for Volume Down(could be used for your own application if the switch is not used). D8 - Used for Green Led instructions(could be used for your own application if the switch is not used). D9 - Used for Red Led instructions(could be used for your own application if the switch is not used). D10 - Used for SPI Chip Select. D11 - Used for SPI MOSI. D12 - Used for SPI MISO. D13 - Used for SPI SCK. D14(A0) - Used for Reset of VS1053. D15(A1) - Used for Data Require of VS1053. D16(A2) - Used for Data Select of VS1053. D17(A3) - Used for Chip Select of VS1053. 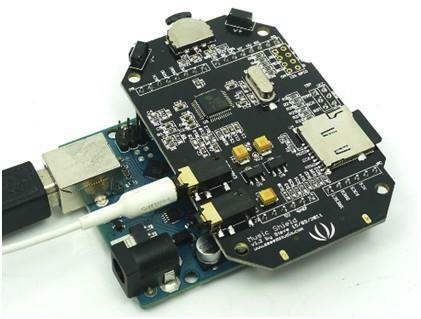 Insert the Micro SD card and the earphone; Plug the Music Shield onto the Arduino/Seeeduino; Connect the board to PC using USB cable. 1.Make sure there are songs in the micro sd card. 2.Download File:Music v1 14.zip and File:NewSoftSerial.zip for music shield. 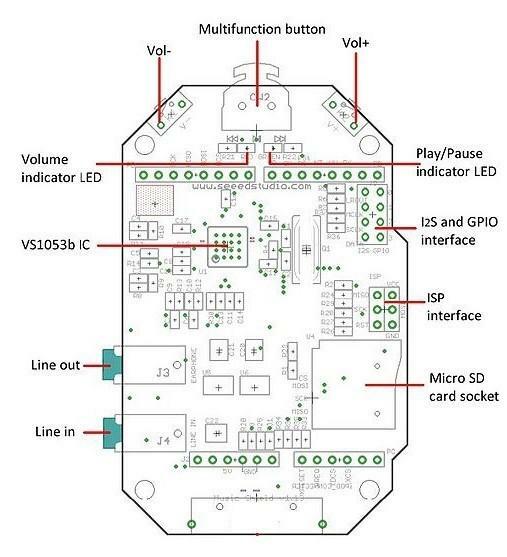 5.Select the corresponding Arduino board, like Arduino UNO or Duemilanove or others. 6.Run the arduino program compile and upload the sketch into Arduino board. 1.Press play/stop knob before pressing the RESET button of Arduino . 2.Release RESET button for a second and then release play/stop knob. When the music shield is beginning to record, the green and red LEDs will blink synchronous. 3.Press play/stop knob will stop recording. For Arduino 1.0: Attention Please:The library of Fat16 between demo-1 and demo-2 is different,so please confirm that you download a corresponding library when using the two demos.And the two libraries can not existed together,so delete a one before using the other. This demo will use the SD library coming with Arduino 1.0. 2.Download File:MusicPlayer v1 7.zip and Fat16for music shield. 4.Select the corresponding Arduino board, like Arduino UNO or Duemilanove or others. 6.Run the arduino program compile and upload the sketch of music_v1_2 -> musicPlayAll into Arduino board. 3. [Under Linux] Copy libraries/Fat16/Fat16util.h to libraries/Fat16/Fat16Util.h (note util vs Util). The includes have the wrong case and this is easiest workaround. 7.Run the arduino program compile and upload the sketch of MusicShieldNewSdLib into Arduino board. Note: About the specific methods of some functions in the library, You can reference the sofeware installation of the Music Shield V2.0.